Multiple Document Discounts: Prices of £799.00, £789.00, £779.00 and £769.00 are available when you order 1, 2, 5 and 10 items or more of this service. 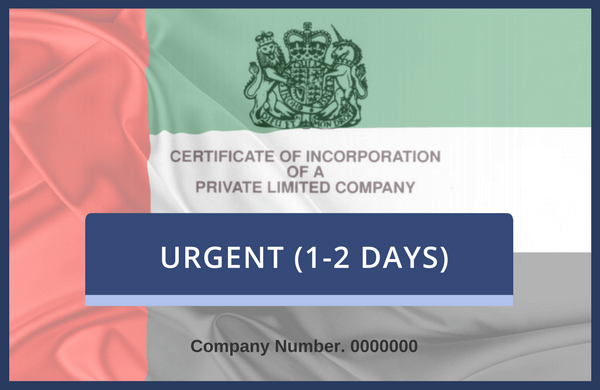 Choose this service to have a company document attested for the UAE. Includes certification beforehand by a solicitor. This is our urgent 1-2 day service. Once your order has been placed, you simply need to either post your document(s) to us, or drop them off in person, to our urgent processing centre in London. Details of where to find us are provided on our Contact Us page. For each step handled in the UK, including the attendance at the UAE Embassy in London, we will personally take your document(s) to each location, saving you time and money. For the benefit of doubt, the service fee includes all the dispersement payments required at each department, including the UAE Embassy's Commercial Fee.